Kick back and take in the beauty of the Coral Sea and the Cairns Esplanade right from your very own private balcony! Ocean View Rooms are spacious and feature an array of modern luxuries. There’s 24-hour room service available, as well as air conditioning, tea/coffee facilities, mini bar and more! Complimentary double upgrade from Mountain View Room to an Ocean View Room! Keep cool and totally relax in your Island Suite King room. Offering up to 56sq. metres, timber flooring throughout, a raised ceiling with ceiling fan, private balcony and plush King bed, you’ll feel calm and right at home here! Features include air-conditioning, TV, tea and coffee making facilities, an ensuite bathroom with bath tub and shower, a mini-bar and more! Avoid the stress of arranging your own travel and let us do it for you! With return flights to Cairns including 20kg of checked luggage per person, when you travel with My QLD, the only thing you need to do is grab some clothes and enjoy your holiday! Spend more time enjoying the beauty of Queensland and less worrying about organising a taxi at the airport, and transport to Green Island! With My QLD, avoid that hassle with our airport transfers to and from your accommodation, and Catamaran transfers to Green Island! Take the whole family with this exclusive My QLD Holiday package. Kids can stay, play & eat for free when utilising existing bedding. Please see Fine Print Tab for details. Cairns City Sights & Surrounds*: Discover all the great beauty Cairns has to offer! With this guided tour you will see sights like the world’s largest themed stained-glass windows, and you will be able to immerse yourself in the rich cultural heritage of the Far North. Visit Cairns Flecker Botanic Gardens and then the natural scenery of the Lower Barron Gorge National Park and much more! Holidays are the time to indulge and, with a bonus $150 Wine & Dine Credit on us, you can do that with ease! Put your credit toward fine dining meals or enjoy drinks and holiday cocktails—whatever you desire; the choice is yours! 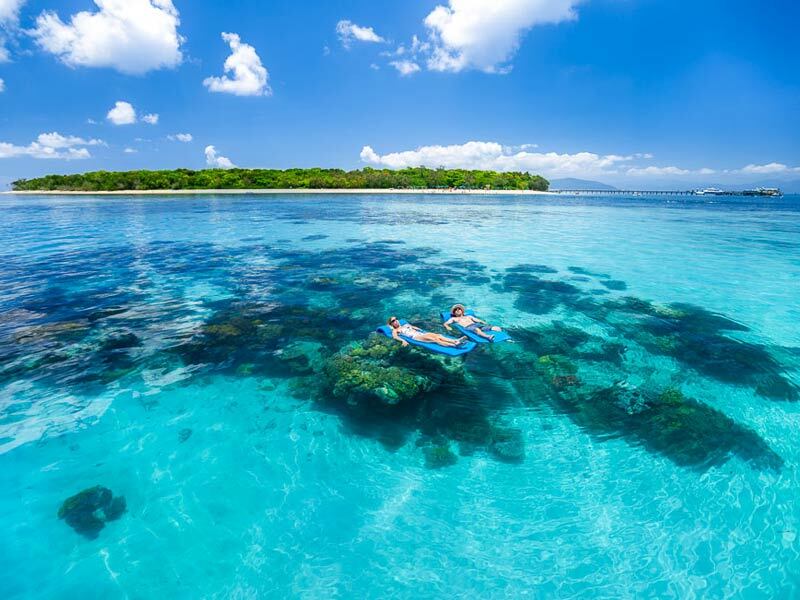 Experience the beauty of the Outer Great Barrier Reef when you embark on an exciting day trip with Great Adventures. Departing from Green Island, you’ll cruise in comfort aboard a modern, fast catamaran to a spacious activity platform moored at a magnificent site on the outer Great Barrier Reef. Here, in this marine wilderness, the marine biodiversity is at its most extreme. With activities for all ages, swimmers and non-swimmers, you’ll enjoy a day of adventure and discovery in this World Heritage natural wonder. Snorkel and dive directly off the platform amongst coral gardens home to extraordinary marine life and rainbow coloured tropical fish. If you choose to stay dry, you can explore the reef in the underwater observatory and spacious semi-submersible. Relax on the sundeck with a buffet lunch and take in the amazing marine-scape. After you’ve experienced the beautiful marine life, on another occasion see even more of the reef with an additional complimentary Glass Bottom Boat Tour, or utilise your bonus 20% discount off dive and free use of all non-motorised Island activities! Experience true Cairns hospitality with 2 complimentary welcome drink vouchers! This island-style greeting is the perfect start to your tropical holiday and will make you feel like a local! Sip on one complimentary drink per person, per day, while you watch the magnificent sunset and reminisce on your day at Green Island! Stay connected with complimentary WiFi access! It’s never been easier to keep in touch with loved ones back home, as well upload all your favourite holiday snaps to your social profiles! The view from the Ocean View Rooms are spectacular! Kick back on the private balcony and take in the beauty of the Coral Sea and the Cairns Esplanade. The interior of the Ocean View Rooms are spacious, spanning 32-square-metres, and feature an array of modern luxuries. The rooms can accommodate up to 3 adults or 2 adults and two children and allow you to choose your bedding configuration accordingly between a queen bed and double fold out sofa or two double beds. There is 24-hour room service available in the rooms as well as free Wi-Fi, air conditioning, ceiling fans, tea/coffee facilities, mini bar and hair dryer are among the other in-room amenities available! 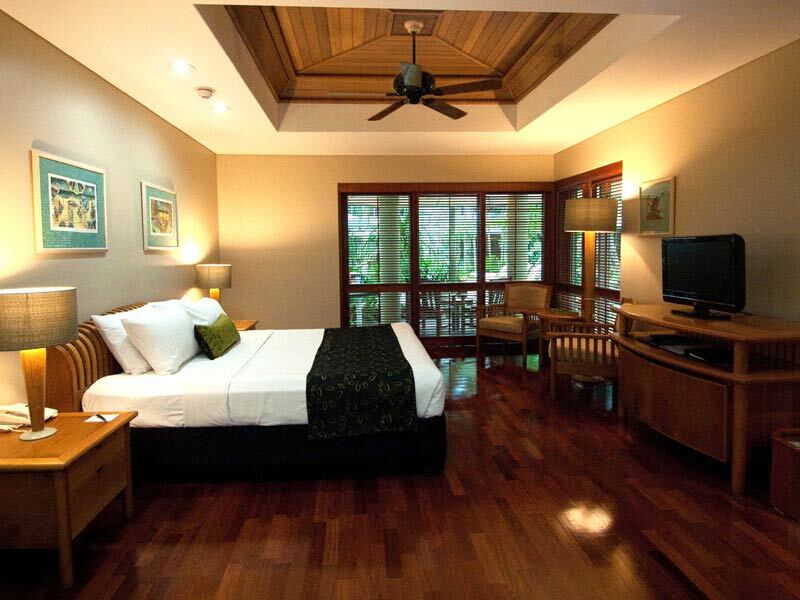 Keep cool and totally relax in your Island Suite King room. Offering up to 56sq. metres, timber flooring throughout, a raised ceiling with ceiling fan, private balcony and plush King bed, you’ll feel calm and right at home here! Features include air-conditioning, TV, tea and coffee making facilities, an en suite bathroom with bath tub and shower, a mini-bar and more! Island Suite King rooms can accommodate up to 2 guests and offer the ideal retreat for honeymooners or couples looking for a tranquil escape! 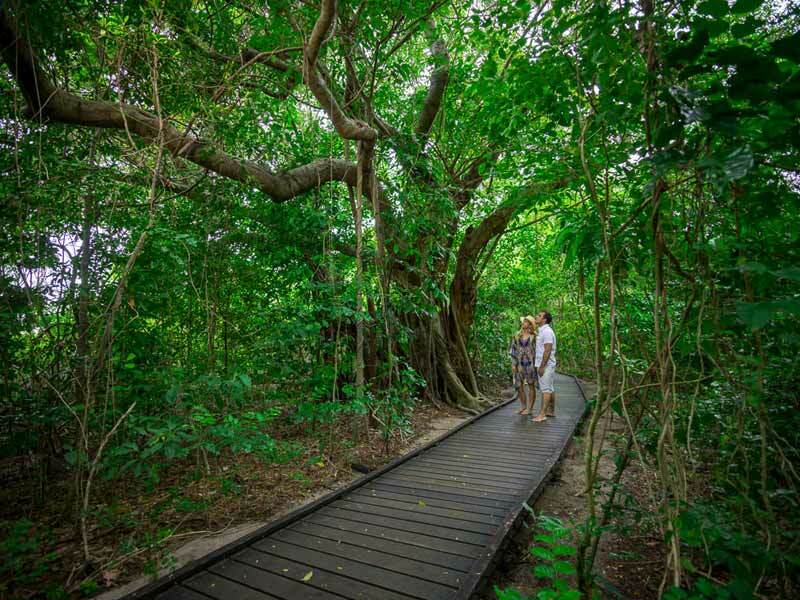 Exploring Queensland’s tropical north with friends? Check-in to an Island Suite Twin room to soak up the calm, Green Island atmosphere in between days packed full of exploration. 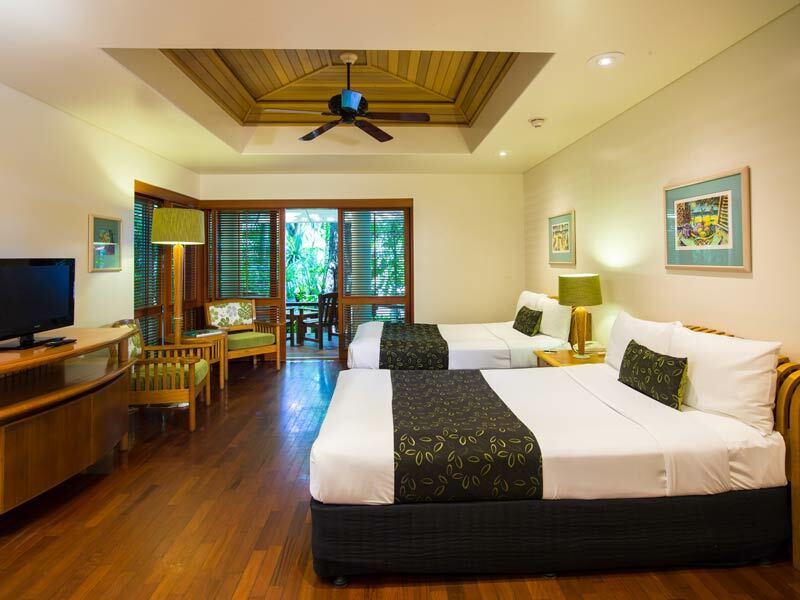 These rooms are air-conditioned for your comfort and set in clusters under the rainforest canopy. They feature Twin bedding, a raised ceiling with ceiling fan, en suite bathroom with tub and shower, private balcony, TV, in-house movies tea and coffee making facilities, mini-bar and more! With up to 56sq. metres of space, Island Suite Twin rooms can accommodate 2 adults and 2 children. 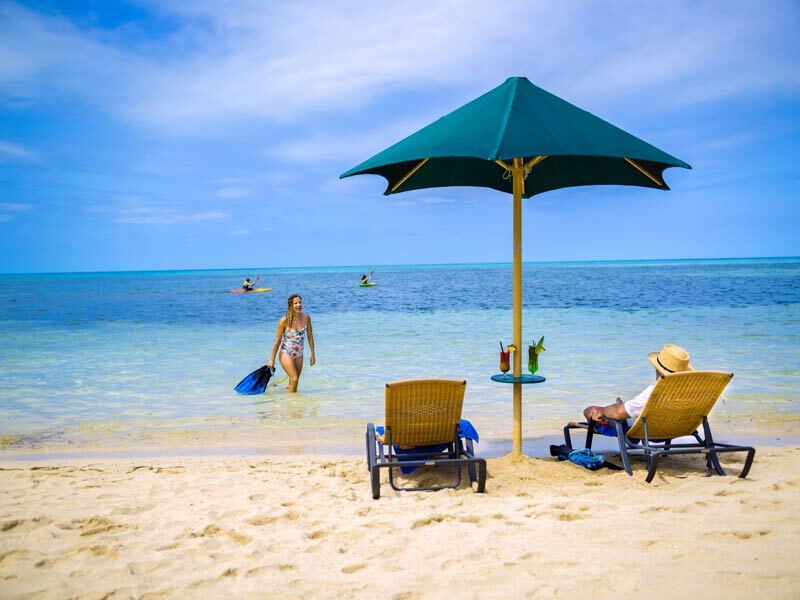 Escape the mainland and check-in to paradise at Green Island Resort! 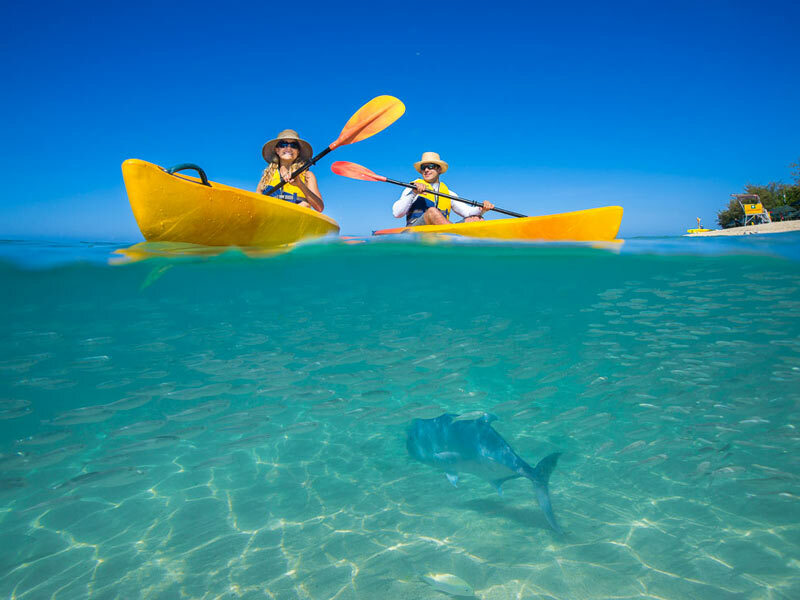 Set just a 45-minute catamaran ride away from the Cairns mainland, this stunning island-oasis offers the very best of Queensland’s tropical north. From lush rainforest vegetation, to the stunning Great Barrier Reef all around, you’ll never run out of marvels to enjoy here! Bask in your luxurious accommodation, enjoy a host of resort facilities and completely unwind—whatever that means to you! 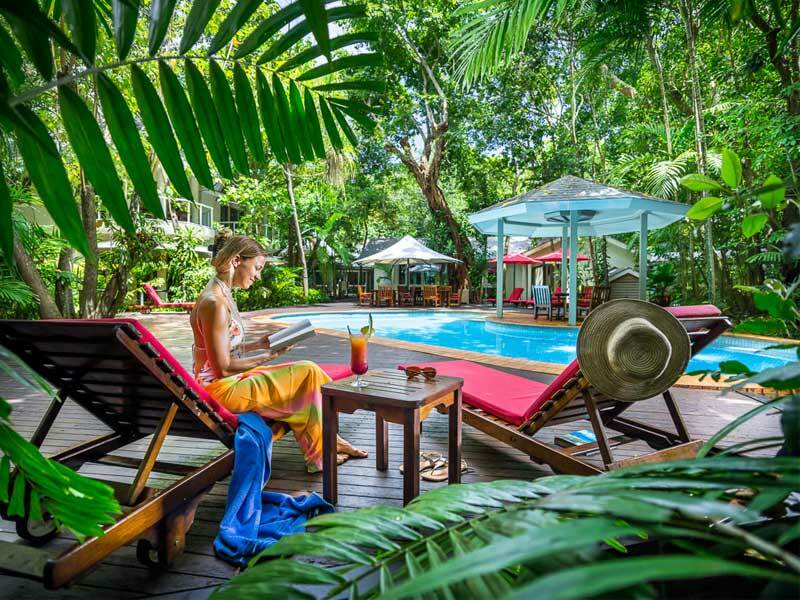 At Green Island Resort you can explore, swim, sunbake and indulge. Read more about Green Island Resort here! #Kids Stay, Play & Eat FREE: Rydges Cairns Kids Stay & Eat Free: Kids up to and including 12 years of age eat lunch & dinner for free when dining with full paying adult. The kids eat free does not apply with the 1 x Fire & Ice Dinner. EAT Free – Kids breakfast is included per room maximum 2 children under 14. Each child is entitled to eat free with each paying adult – 1 Adult paying = 1 Child Free. We do not allow 1 Adult paying = 2 Children free. Orders only include the main a la carte menu – this offer applies to Emeralds Restaurant only. It may not be applied to outlets such as Reflections Bar & Canopy Grill. STAY – Kids will stay Free in existing bedding only. Additional bedding requirements will incur additional charges. PLAY** – Kids will enjoy the complimentary use of non-motorised water equipment (snorkelling, kayak etc), beach hire (volleyball, sun lounges, beach umbrellas etc. ), DVD hire through Reception – we do have a limited number of board game options also available complimentary. **Parental supervisor/guidance/permissions may be required at the time of complimentary hire. *Cairns City Sights & Surrounds: Cairns Discovery Tours is Cairns’ official city sightseeing tour, in operation for over 20 years. Whether you love waterfalls, birdwatching, tropical plants, history, culture or coast, there’s something for everyone. We look forward to welcoming you on board! The afternoon tour begins at the water’s edge, gateway to the Great Barrier Reef. Travel in air-conditioned comfort with your local guide; step inside St. Monica’s Cathedral where you will marvel at the world’s largest themed stained-glass windows. Explore Cairns and delve into the city’s history. Immerse yourself in the rich cultural heritage that is the Far North. the Northern Beaches or Cairns City at the end of the tour. ~Hartley’s Crocodile Adventure: Don’t miss the best place to see crocs and Australian wildlife in Tropical North Queensland! 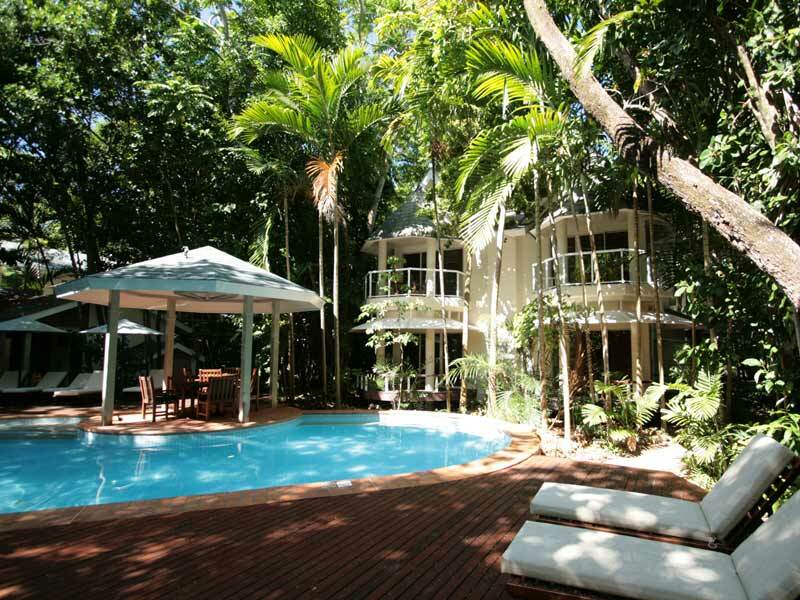 Our friendly driver will collect you from your accommodation for the scenic drive to Hartley’s Crocodile Adventures. After arrival, there is plenty of free time to explore the park and discover the amazing wildlife including crocodiles, koalas, wallabies, turtles, snakes, waterbirds, cassowaries and more! See the notorious head shake and death roll of a huge Saltwater Crocodile at the Crocodile Attack Show, and cruise the Melaleuca Wetlands to see crocodiles in their domain. Your return hotel transfer will depart Hartley’s at 4:45pm. **Green Island $150 Wine & Dine Credit: This amount is to be credited to the guest’s room account on check-in which can be applied towards food and beverages at the resort. WD Credit cannot be applied towards external third party service providers e.g. Tours.